hether you run a giant corporation or work in a small business, it’s more than likely that you regularly deal with people of different cultures―from customers and suppliers to salespeople and colleagues. It simply can’t be overstated: You will have trouble succeeding in business today if you don’t appreciate and know how to actively manage global cultural diversity. 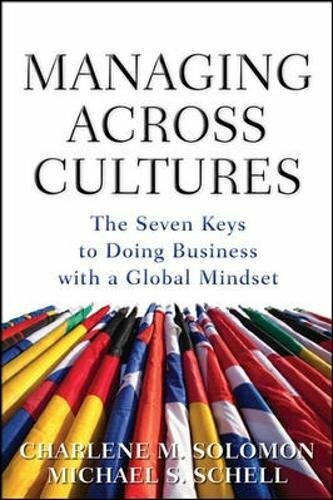 Managing Across Cultures examines why people around the world behave as they do and provides actionable tactics for succeeding in today’s global business environment. Experts in the field of cross-cultural training, Michael Schell and Charlene Solomon describe seven readily recognizable behaviors and explain what they mean, how to interpret them, and most importantly, how to respond to them. You’ll also find out how underestimating cultural influence caused serious problems for organizations like DaimlerChrysler and Wal-Mart. Managing Across Cultures takes you far beyond other books that simply catalog the customs, gestures, and language vagaries of other cultures. This in-depth, strategic guide will help in every facet of business―from hiring and motivating employees to developing winning sales pitches and marketing campaigns.